Solar Art installed solar film to a home in Laguna Beach, California. The customer was having a problem with their house getting really hot. They have large windows all throughout their house so they can enjoy the beautiful ocean views they have. The customer tried having blinds and shades installed and while it did help with the heat, it made their rooms dark and they lost their ocean view they worked so hard for. They decided to reach out to Solar Art to see if window film could potentially solve their heat problem. They worked with our sales team to find a window tint that would work best for them. They decided on a neutral Llumar solar film. The window tint this customer installed is a heat blocking window film that will help with the amount of heat that enters their home. They had it installed on rooms throughout their entire house. This solar film, like decorative window film, security window film and anti graffiti film will block 99% of UVA and UVB rays. Solar film can reduce up to 75% of heat that enters a space. 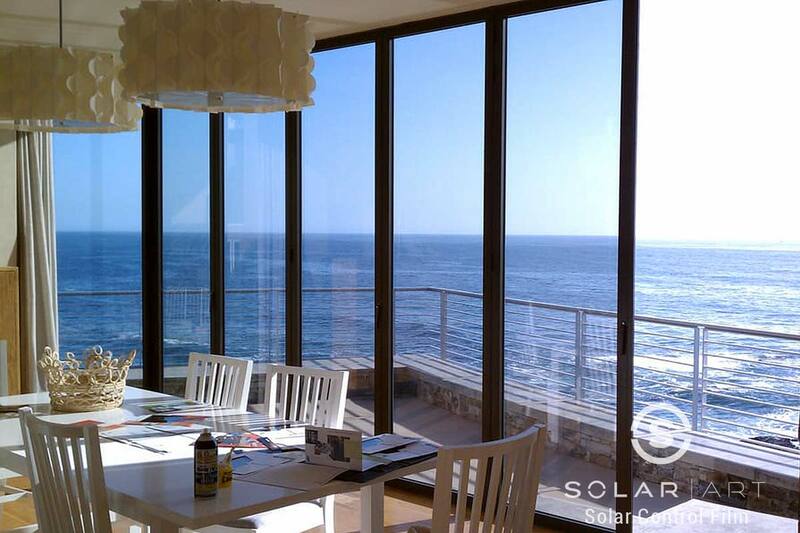 This solar film won’t darken a room too much and will still allow the homeowner to utilize their beautiful views. Not only does solar film help with reducing heat, it can even reduce glare and help prevent against sun fading. Window film is easily removable with no damage to the glass if removed by a professional company. Certain window films are eligible for a rebate through your utility company to help reduce your energy bills. The customer was extremely happy with the end result of this installation. They could notice their house was cooler and it made their space more enjoyable. But most importantly, they still got to keep their amazing ocean views! Solar film works great in both residential and commercial settings such as a private office or even a storefront. Contact Solar Art today for a free quote! Check out our other types of window film installations! Contact us directly to talk about solar film! Solar film can be heat blocking window film that reduces heat, glare and blocks 99% of UVA and UVB rays. Contact Solar Art to learn more!